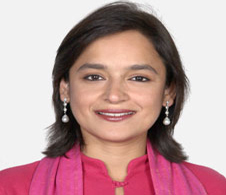 Independent Director, Eicher Motors Ltd.
Ms. Manvi Sinha is a television journalist/ anchor and is presently working as consulting anchor with Times Global Broadcasting. Ms. Sinha has over 16 years of experience in television news/ media including a 5 year stint as the presenter of the prestigious India Business Report on BBC World. She has also been the Managing Editor of NDTV Profit. A graduate in economics from St Stephen's College, Delhi University, Ms. Sinha combines a sound academic background with rich journalism experience.